Olbia Costa Smeralda Airport parking spaces are located right in front of the terminal, about 20 meters from the terminal entrance. More than 1,100 stalls are available to our customers. • Sector C, short term, the closest to the airport (not available online). The customer can access to the parking areas with his own vehicle by withdrawing the relevant ticket automatically issued at the entrance or - in the case of subscribers or on-line purchases - through the registration of the plate made through electronic devices. can be purchased directly at the parking office, open every day from 7.00 am to 11.00 pm, or ONLINE, both as a single stop and as a season ticket (annual, six-monthly, quarterly and monthly). 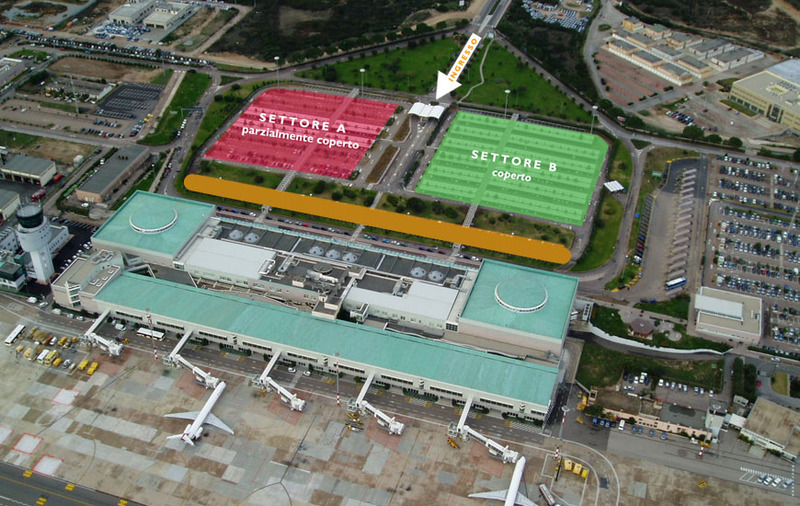 The parking area Short Stay (sector C) positioned 20 meters from the terminal, allows up to a maximum of three daily free entries within 10 minutes of parking. All stops over 10 minutes are regulated at a rate of € 1 every additional 10 minutes, for the first two hours. Vehicles that exceed the limit of 3 daily entries will be monitored with an automatic license plate recognition system and will be subject to a fee of € 6 (six) per single pass, in accordance with the Enac Ordinance of 1/2019 / OLB: “in consideration of the safety requirements of vehicular and pedestrian traffic and the characteristics of vehicle traffic in the vicinity of the terminal, entry with free allowance is permitted up to a cumulative maximum of 3 (three) entries per day by the same vehicle ”. Over the third entries, the fee will be charged according to the rules of the related area without any deductible. " - or following the procedure indicated, directly at the automatic column or in the automatic pay stations by credit card. Cash and all major credit cards are accepted but at the moment it is not possible to use the ATM. The automatic cash registers are very easy to use, just insert the coupon in the space provided and follow all the instructions that appear on the monitor. The automatic cashier accepts payments with coins, banknotes of 5, 10, 20 and 50 euros or credit card linked to the main circuits. After making the payment at the automatic pay stations you’ll have about 10 minutes to leave the car park, after this interval the parking will be calculated according to the current hourly rate. For further details, refer to the Parking Regulations available in pdf format at the following link and the Enac Ordinance, available at the following link.